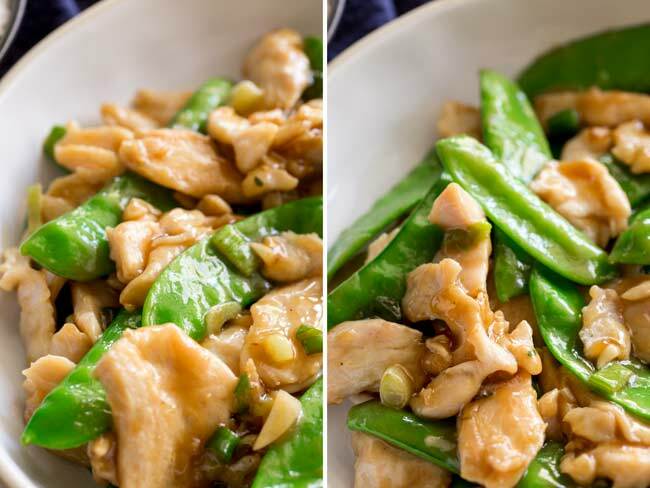 With this Takeout Style Chicken and Snow Peas stir fry, you can have a healthy Asian chicken dinner on the table in no time. Making Chinese takeout recipes at home, is much easier than you think! 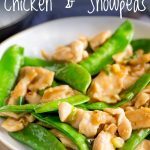 They are perfect for families as they are quick and there are plenty of veggies included, plus the wonderful Chinese savory sauce adds the authentic takeout taste BUT this Chicken and Snow Peas is better than takeout! With a few tips and tricks you can have authentic tasting Chinese at home! You don’t need a wok! In fact I recommend a heavy based skillet. Because most standard household stove tops don’t come with a wok burner, you find that a wok doesn’t get as hot as it would in a commercial kitchen. So using a skillet or fry pan is one way to get a higher heat for your stir fry. You can read more about this in my Takeout Style Beef and Broccoli post. Use the highest heat you can. Because we want to recreate the takeout taste we want to cook the meat and veg as quickly as we can to keep the fresh flavor and the authentic crunch you get with takeout. Have everything prepped before you start cooking. Stir frying is quick cooking so you want to have the veggies and meat prepped, the sauce combined and the garlic sliced. That way once you start cooking you can just add things in when you need to, rather than overcooking bits because you were still chopping the next ingredient. Buy a few Asian store cupboard staples. To get the true authentic taste of takeout you want to use several ingredients that really boost the flavor. In this recipe it is oyster sauce and Chinese Cooking Wine. They give you authentic flavor and last for ages so you will get your moneys worth. Where to buy the Asian store cupboard staples? I have found that the grocery stores are getting better and better at stocking these ingredients. Whenever I order takeout one of my favourite things is how soft and tender the meat is. Whether it is chicken or beef it is always melt in the mouth tender. I learnt a trick from a Chinese night cook when I was working in a hotel and it is possibly the BEST kitchen hack I have ever learnt. It is so easy and gives you that authentic soft tender meat. The trick is baking soda. Also known as bicarb of soda, bicarbonate of soda and sodium bicarbonate. Don’t get it muddled with baking powder, that won’t tenderise you meat. The baking soda is sprinkled over the meat and left for 15 minutes. Then it is rinsed off really well and the resulting meat will be so tender. This process works because the baking soda is an alkali (the opposite of an acid) so when it is sprinkled over meat it raises the pH of the surface. This reaction makes it hard for the lengths of protein within the meat to tighten up. So when heat is applied to the meat, i.e cooking, the proteins don’t contract and tighten. So the meat doesn’t get tougher. Did you know that snow peas aren’t called snow peas everywhere? 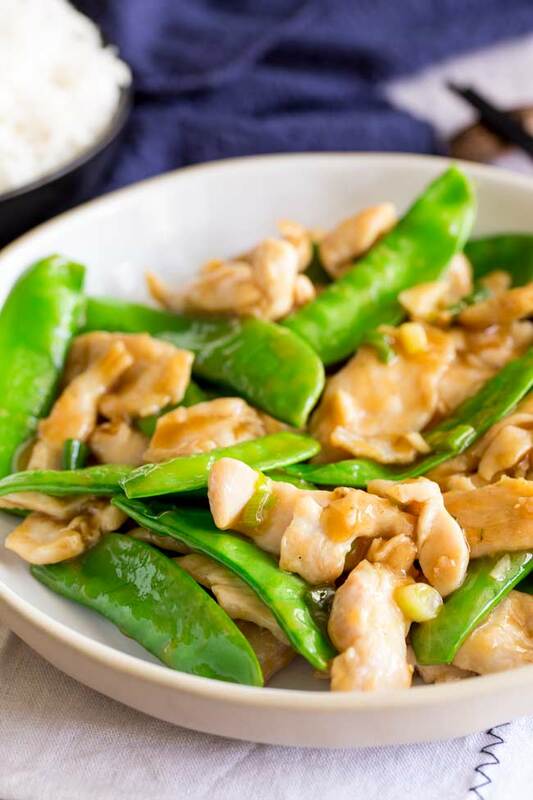 In the UK they are called mange tout (or mangetout) so for my English readers this is Takeout Style Chicken and Mange Tout. Pinch the curly end of the snow pea with your thumb and forefinger. Hold the snow pea in the other hand. Twist off the curly end and before it is completely removed, pull it downward along the pod to remove the string. You can also use a knife but the pinch, twist and pull method is much quicker. Can you reheat stir fry? You can, and I was once told by a Chinese chef that many western dishes were created to make packaging them up and warming up leftovers easier. I don’t know how true that is, but it makes sense that takeout restaurants would want to make dishes that still taste great once you get them home. 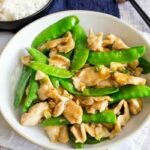 This chicken and snow pea stir fry does reheat, but the snow peas go a little softer and not quite as green. And the sauce takes on more of snow pea flavor. If you have leftovers then yes you can reheat them but I wouldn’t plan to make this ahead. This dish is perfect for serving with plain white rice, but if you want to make something different then check out these other dishes. 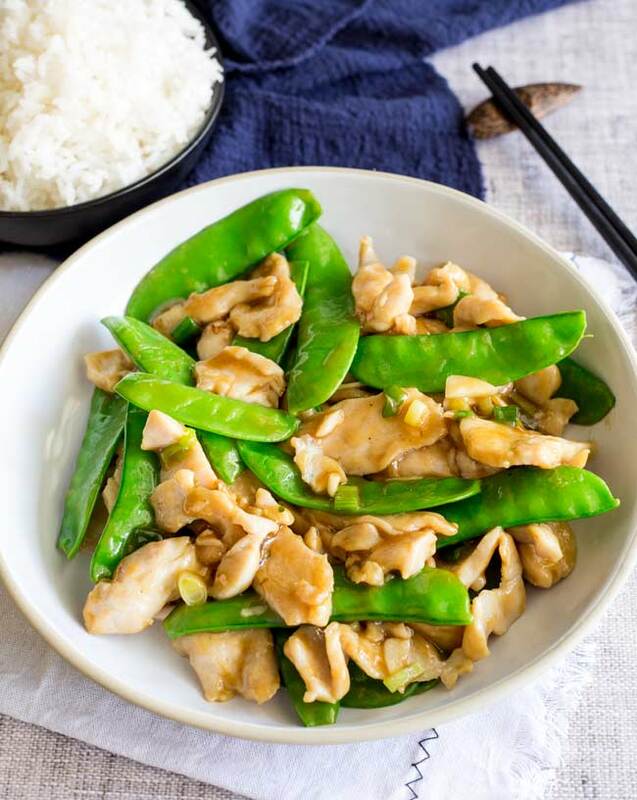 Why not pin this recipe for Takeout Style Chicken and Snow Peas. Pin it here. 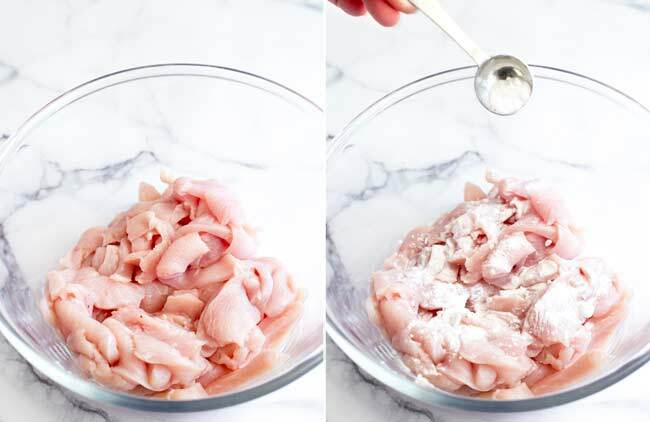 Slice the chicken into thin strips and place in a not metallic bowl. Sprinkle over the baking soda and leave for 15 minutes. Trim the snow peas, peel and slice the garlic and thinly slice the sting onion and set them all to one side. In a small bowl mix the sauce ingredients together and set aside. Pour the oil into a large skillet or fry pan over a high heat and let it get hot. Add in the snow peas and chopped green onions and cook for 2 minutes until softened. Turn the heat down to medium, then add in the garlic, give the sauce a stir and pour it over the meat. Cook for a minute or so until the sauce has thickened and has coated the meat and veg. Baking soda is also known as bicarb of soda, bicarbonate of soda and sodium bicarbonate. Don’t get it muddled with baking powder, that won’t tenderise you meat. Chinese Cooking Wine is sometimes called Chinese Cooking Rice Wine, Shaohsing Rice Cooking Wine, Shaoxing wine or Shaoxing Cooking Wine. 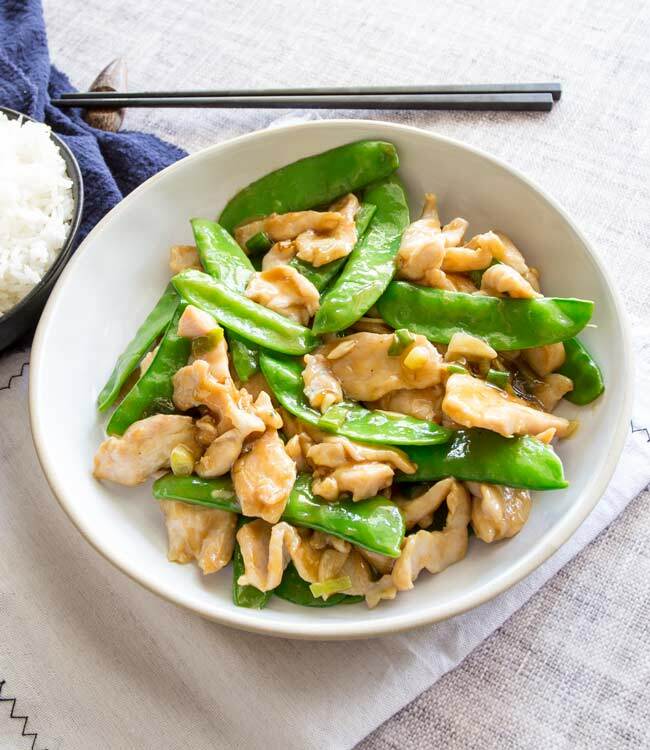 If you love food why not subscribe to my newsletter, I will drop you an email every now and then, just to say hi and send you a couple of recipes I think you might love, like this Takeout Style Chicken and Snow Peas.